I always feel a sense of relief when I finish a project requiring extra skills. This blouse is one of those projects that used skills I don't use very often when making clothes for my boys or my husband. It also required skills I don't use for most everyday clothes. 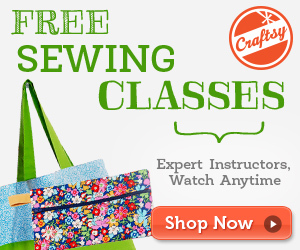 I did want to practice some new skills I learned during Leisa's sew-a-long on AChallengingSew.typepad.com. I did a few things differently and have a few ideas in case I want to try this again. One of my first decisions after completing the muslin was to decide on the fabric. Silk would have been ideal, but I hadn't decided on the fabric for the Marfy skirt and jacket. I wanted to do the sew-a-long while the sew-a-long was being done, so I looked at some fabric while I was picking up some patterns at my local Joann's. I found a couple and surprise, they were on sale for 50 or 60% off. I only needed a yard so I picked a couple that would work with most of what I have. 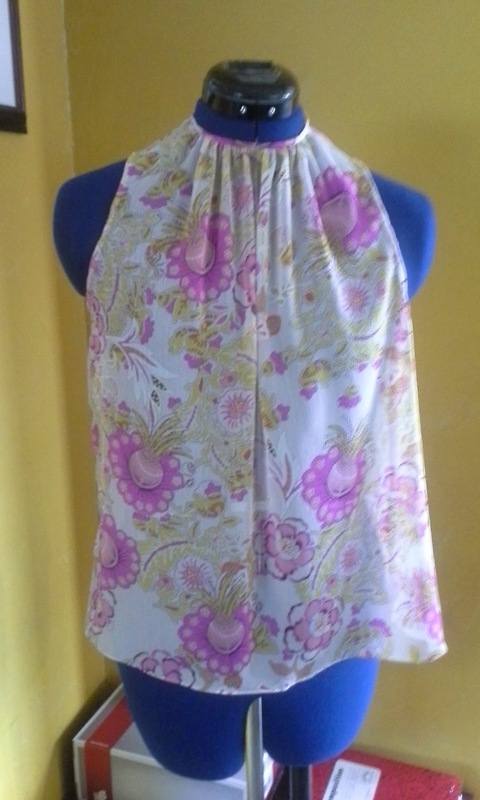 I picke a pink, a white and a flowy sheer pink print. I decided my first attempt would by the pink print. On sale it was $3.50 for the whole thing. Since I decided to eliminate the colar and go with bias binding, it was quick to cut out. Only two pieces. Leisa suggested using the muslin and creating a paper pattern. If I had been wise and used her advice, much of the rest of this process would have been simpler. However, I thought I knew best. I used my original traced pattern without seam allowances. I decided that I would thread trace the seam lines. This takes some time, but I find it relaxing. See how loose these are? 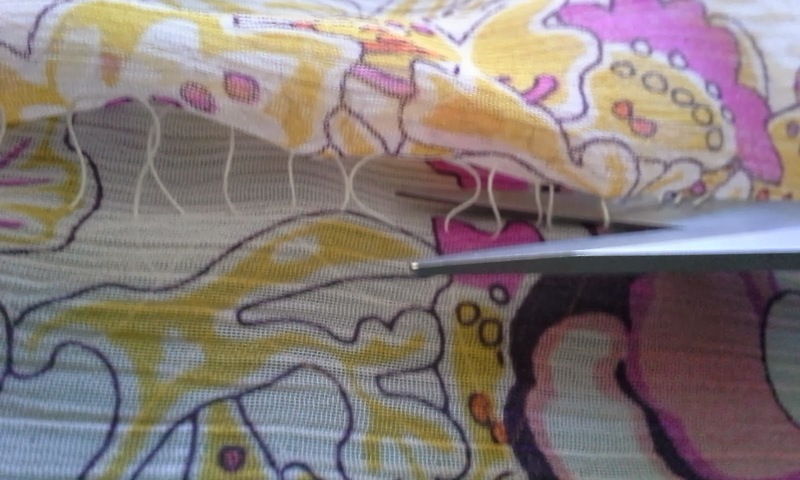 To thread trace through multiple layers, you baste around your pattern with extremely loose stitches. 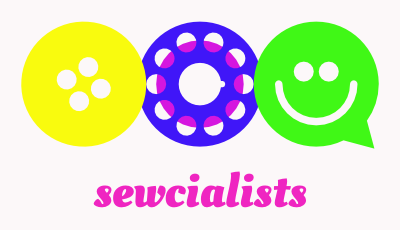 Make sure to extend the seamlines beyond where seams meet. This will give clear corners. 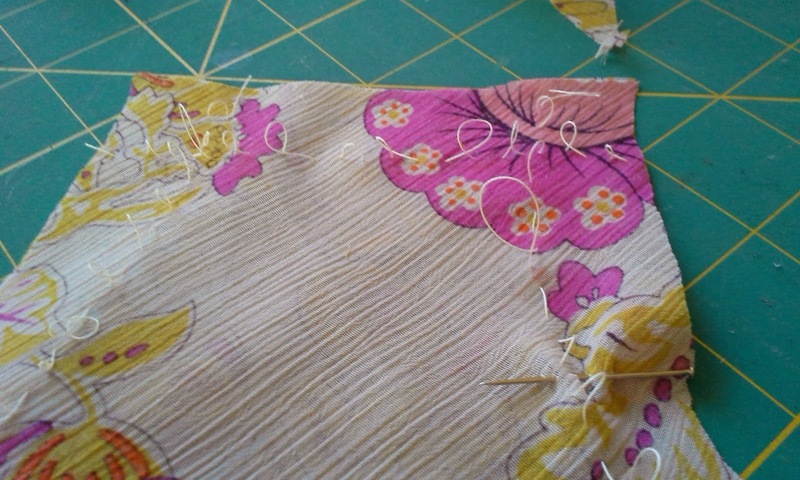 Since I was going through two layers of fabric, I had to pull the pieces apart and expose the stitches inside. Then cut the threads and LEAVE THEM THERE. 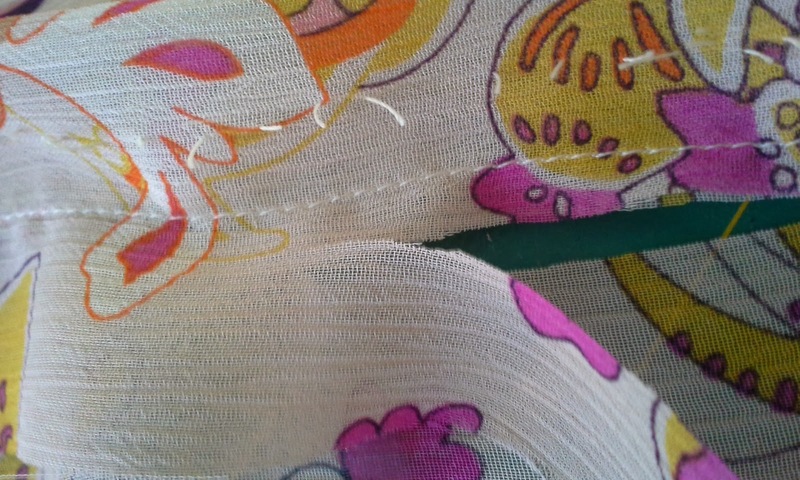 The thread pieces are now showing where your seam line is. I'm always amazed that this works! The threads are the seam lines. The back opening is sooooo cool. Leisa shows us how to do this. I'll just show the pictures. 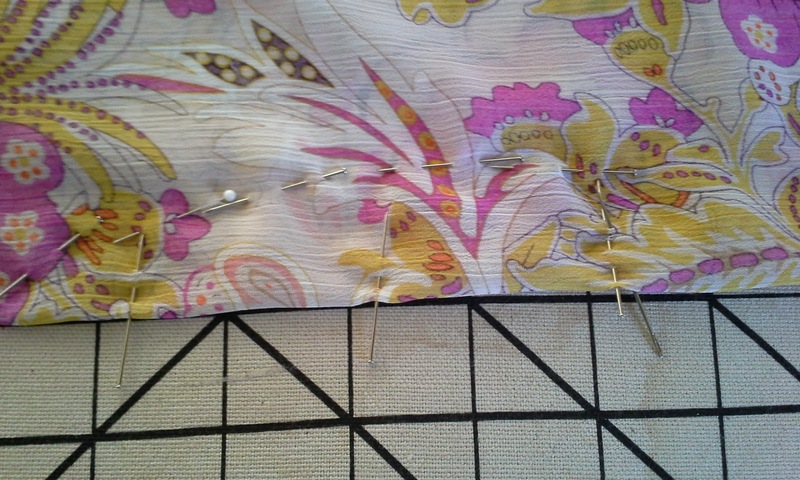 The pins are showing the locations to stitch and where to clip. 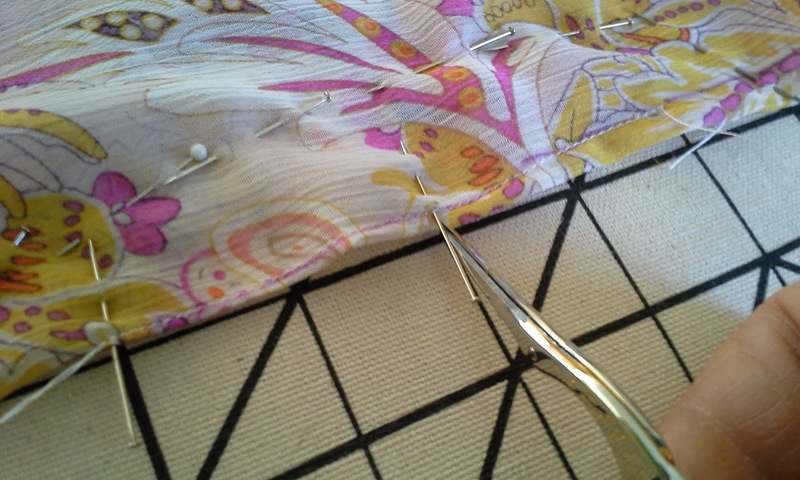 Snip at the half-way mark between the stitched dart. almost invisible on the right side. the threads. They stay in better than one would expect. 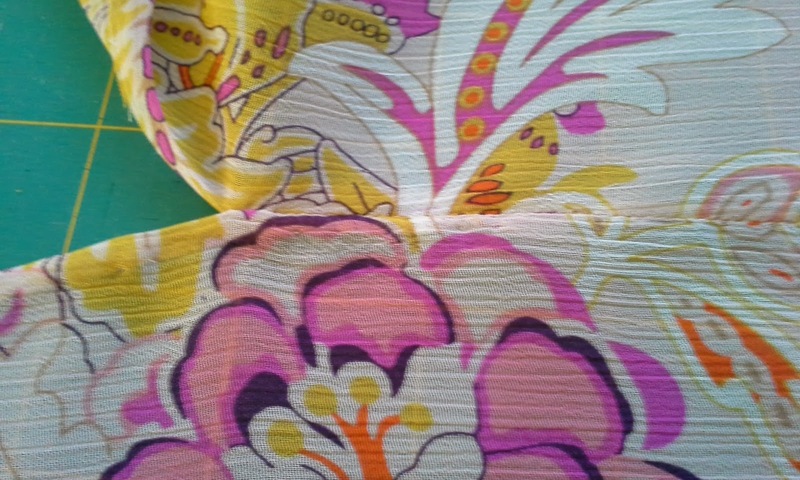 I had decided to use French seams since this was a light and sheer fabric. French seams allow encase the seam allowances, leaving the finished elegantly. Trim the seam allowance. It will be encased inside. 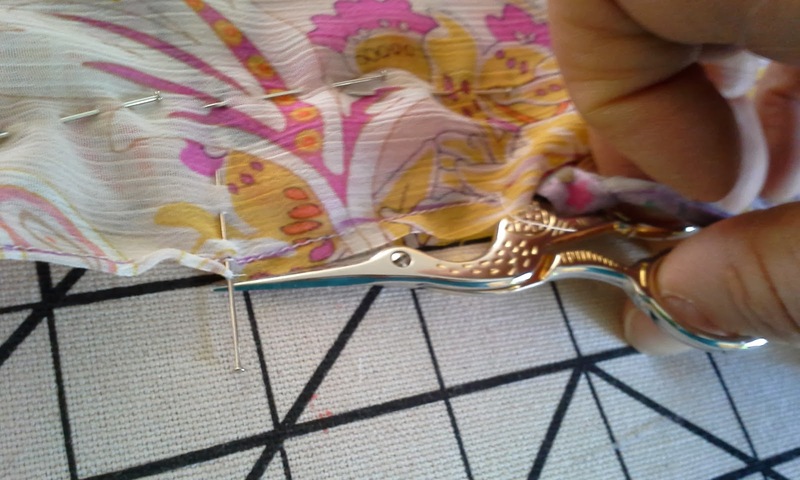 To create a French seam, put the wrong sides together and sew outside the seam allowances. I used the width of my presser foot. Then iron, trim and turn wrong side out. 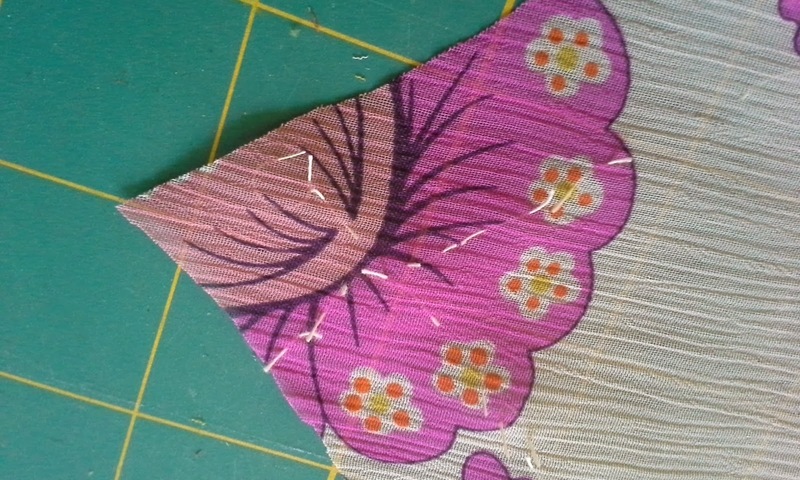 Because I was finding that my fabric was disintegrating each time I touched it, I left almost a quarter inch when I trimmed the seam allowance. Unfortunately, this left me with a wider encasement than I would have wanted. But my seams were done and no one else would really notice or care. to stitch. I plucked them out after my seam was finished. To finish the armholes, I used bias binding. I used 1 inch, but I wish I had used wider and had a larger seam allowance. This fabric was fraying almost as fast as I could sew. In fact, there are a couple of places that will probably start showing without many wearings. I first attached the open binding by machine. 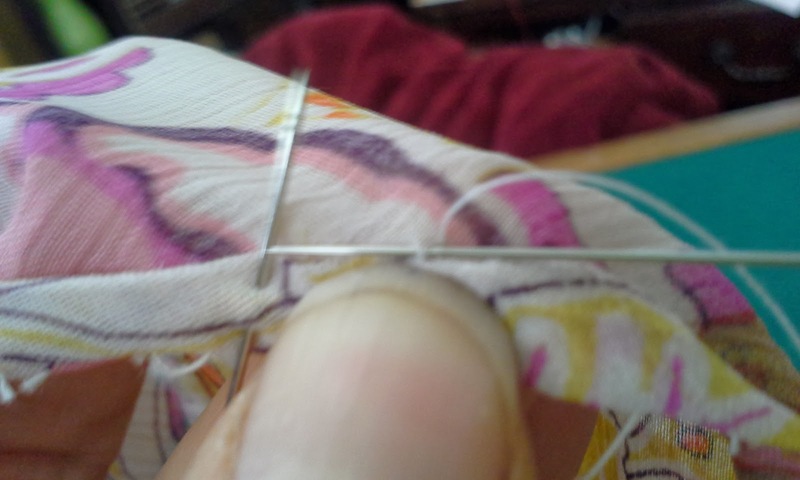 Then, I sewed almost invisibly by hand.I picked up the fewest threads on the right side as possible. Unfortunately, the threads didn't always like that and would show pulls for inches or simply break. 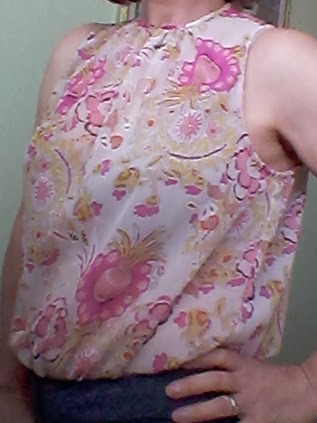 I also used bias binding on the neckline. Unfortunately, I tortured it more than I should have and have fraying. 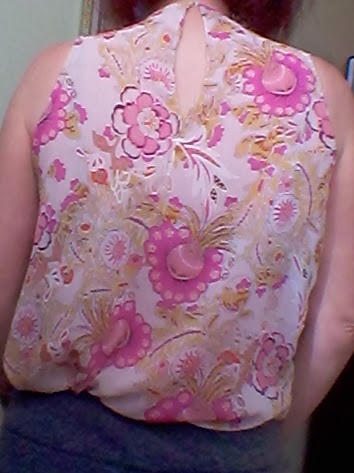 It isn't visible on the right side, but I know it won't be a blouse I will wear for many years. I really enjoyed the process of this project. 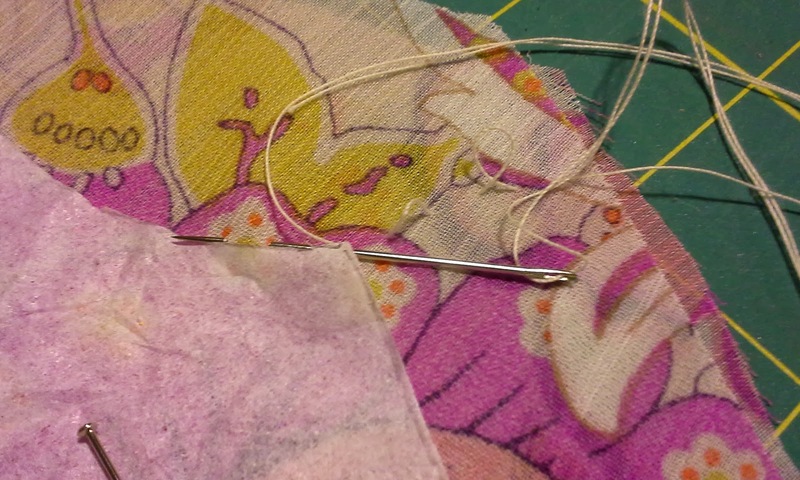 However, I did begin to get burned out when the fabric was fraying. I kind of put me into a simmering panic. I also learned that a little more seam allowance would have been very helpful. I will give myself larger seam allowances. 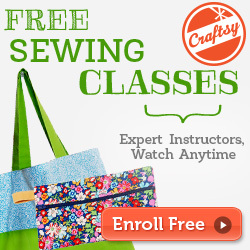 I will possibly use the machine to do more stitching instead of so much hand stitching. 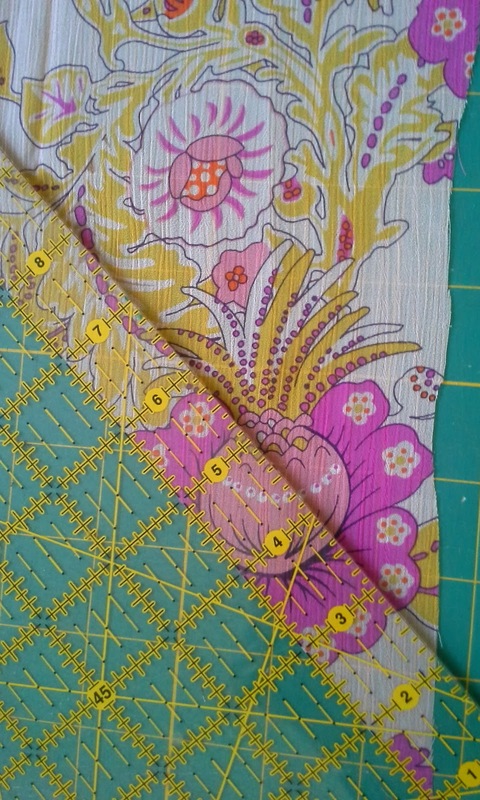 I will cut larger bias strips. 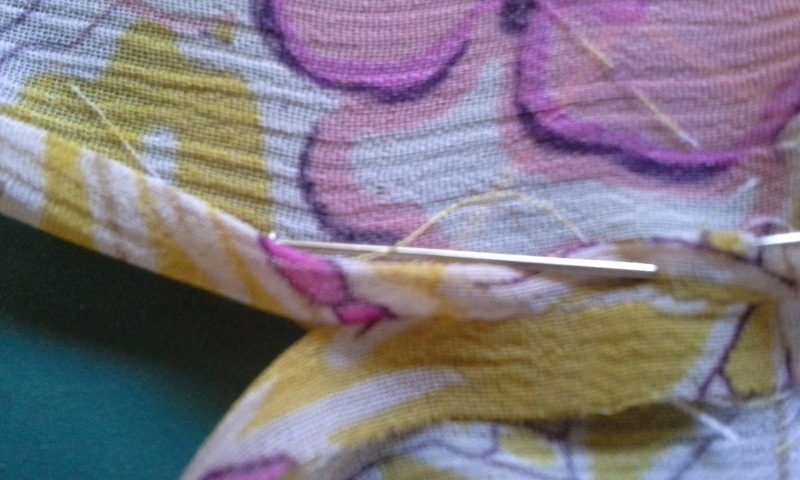 fraying fabric is such a nightmare, how can such a simple thing fill me with so much dread? 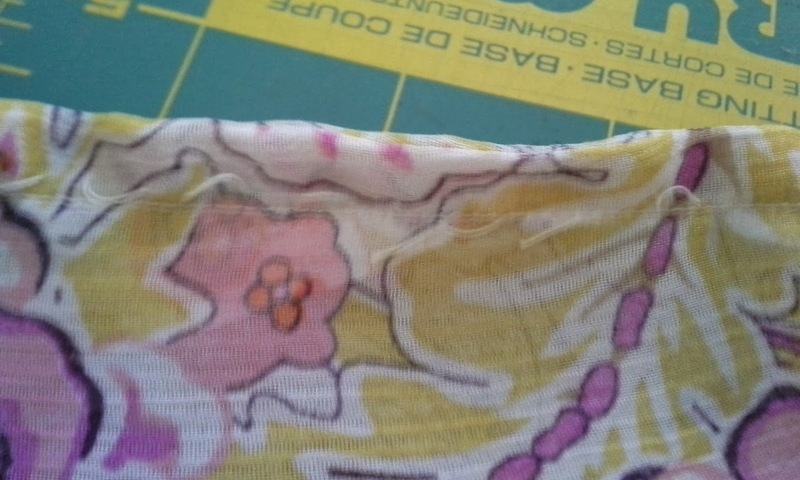 Fraying fabric gives me nightmares. 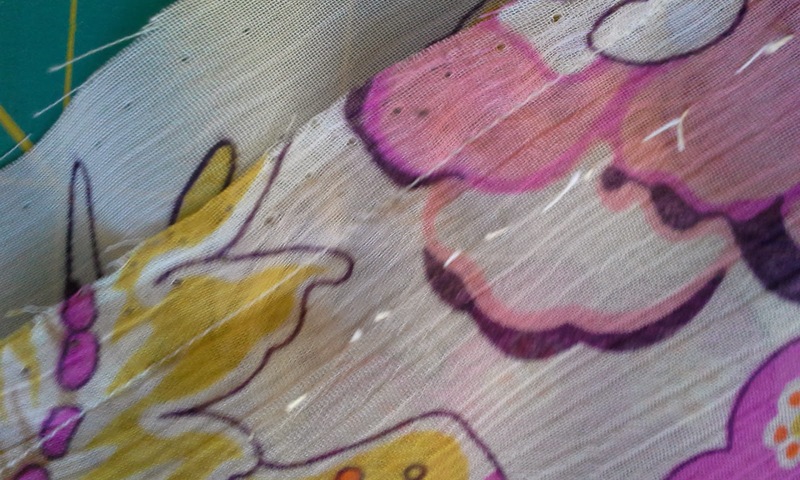 I have memories of ruining projects with simple fraying fabric. It is usually unfixable.